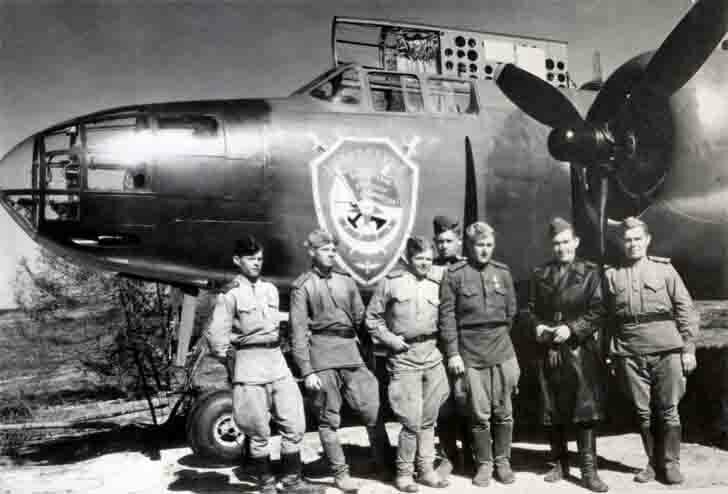 Soviet crew of A-20 “Boston” bomber of the US production. The commander – deputy regiment commander, Major General George A. Osipov. A-20 “Boston” bomber of the 221 th Bomber BAKHMACH Order of Suvorov Air Division, the 6th mixed Lublin The Red Air Corps (which is why on the aircraft such emblem), the 16th Air Army, Belorussian Front. US A-20 “Boston” Bombers (Douglas A-20 Havoc/DB-7 Boston) were supplied to the Soviet Union in large numbers under the Lend-Lease Act, and have shown themselves excellent fighting machines that respect and in aviation and ground forces. Source: Family archive of V.G. Osipov.